Today there is illness in the house and so I have decided to cook the one thing which is guaranteed to knock it out. The miso soup here is soothing and comforting but also packed full of ginger, which I have always believed gets rid of colds quicker than any sort of medicine. This may or may not be wishful thinking. 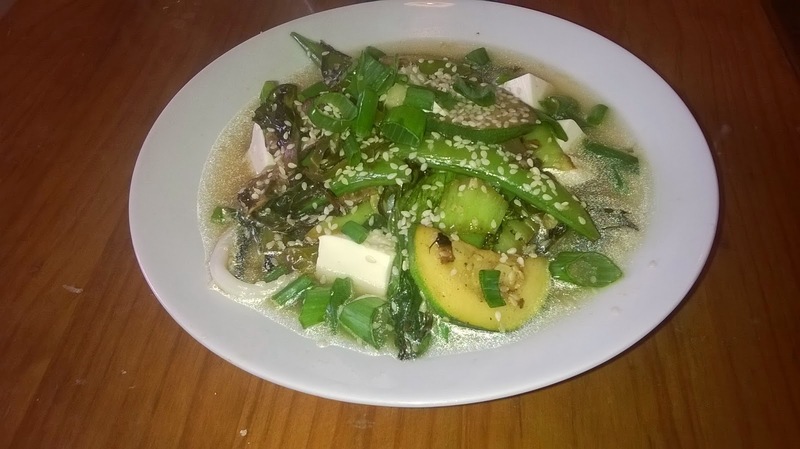 There are five different types of vegetable in the stir fry, which must go some way towards replenishing vitamins, and I put tofu in the broth too – which apparently cures almost everything; read the nutritional benefits here if you don’t believe me! You can make this in about 20 minutes, and this will serve 4. 1. Finely chop the ginger. Put a large pan filled with 1.5 litres water on the hob. Add the ginger, miso paste and mirin, stir, then bring to the boil and allow to simmer for 10 minutes. 2. Meanwhile, heat the oil in a wok on a medium heat. Add the sliced garlic, fry for 15 seconds. 3. Tip in the seaweed, sliced mushrooms and sliced courgette. Stir fry for another minute, then add the sliced pak choi, whole sugar snap peas and soy sauce. Stir fry for another 2-3 minutes. 4. Stir in the sliced spring onions and sesame seeds. 5. Chop the tofu into 1cm cubes and add to the soup along with the noodles. Bring back to the boil for 1 minute. 6. To serve, use tongs to lift a serving of noodles and tofu into each bowl. Top with a generous serving of the veg and then ladle over the soup. Enjoy!